Since I found very little about the subject, I am posting my experiences with building a Point to Point wireless bridge. The distance is 3.5km line of site. The roofs are visible from each other and there is only one commercial property between the two (its a strip mall). All other property is residential. Contact me at terry_donald at hotmail.com with the subject: Re: Wi-Fi Log Book if you have any comments or suggestions. This page is listed as a public service and is FREE, but remember, you get what you pay for. PC Mag article about the kit - NOTE: I am getting better results than they did. Well, the box is here ($1750) and all the parts with it. · 2 sets of mounting hardware. Everything gets unpacked and I pull out the 4 page-8 section Step-by-Step Installation Guide. 1. Introduction – basic concepts of stuff I should have known before I ordered this package. AND a warning about antennas, lightning, and power lines. 4. Confidence Test – a real world description of how to go about making these things talk and making sure things work. 5. 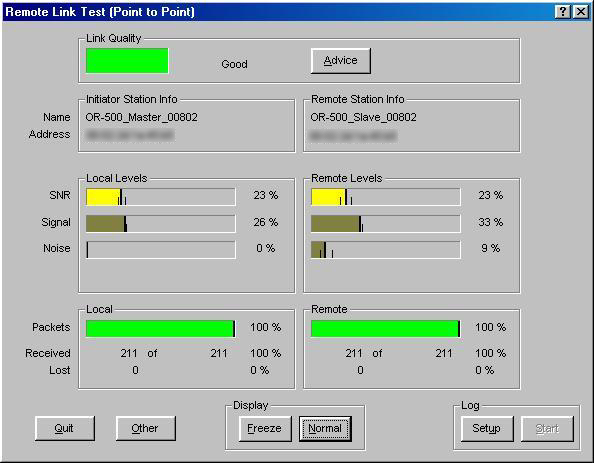 Installing Main LAN Side – Plug in the Master to the Main LAN. 6. Installing Remote LAN Side – Plug in the Slave to the remote LAN or PC. 7. Final Steps – special consideration for different circumstances. 8. More information – where else to look for help. What's this? Each license agreement has a sticker with the MAC address of the MAC address of the OR-500 it goes with. At this point I break out the 3-hole punch and an empty binder and start sorting stuff out. I next install the software off of the CD (a small program that loads in under 2 minutes) and put that in the binder, as well. Its time to head to the house. 5/21/02 - I was home with sick kids for most of the day yesterday and didn't get to play with the new toys except of showing the bosses the “ray gun” (the yagi). After getting the mornings fires put out, I plug up the Master to the hub on my desk (Intel Express 220T) and hook plug everything in. Fire up the program and try to talk to it. Hmmm….can’t seem to find it. Hub has lights, so does OR-500 but no go. I'm using the gray cable and looking I can tell its not a cross over. Hmph. So I take the slave over past my secretary's desk and plug it together and plug in my laptop using the red crossover cable. Now I can't talk to the network. Pull out the Step-by-step guide and read “The Point-to-Point kit is pre-configured at the factory so the equipment only requires mounting and connection.” Well that’s fine and dandy, but its not talking to my network! OK – time to start debugging: Master is plugged into network? Check. Antenna is plugged in? Check. Lights are correct on Master? (power, network detect, wireless signal detect). Check. Slave is the same? Check. Lets try the program again. Tell it search and TADA! Found two routers: a master and a slave. Now we’re getting somewhere. Check Slave’s settings and go ahead and set its IP addresses for my network. Next, the Master. I change its setting and stand up and can see that it is indeed rebooting to save them. So I can talk to the slave from the laptop and I can talk to the Master via the Slave. Hmmm. Well more fires are calling so I'll leave it for tomorrow. 5/22/02 Did nothing but fight fires and play catch up from being out of the office Monday. Only thing I tried was changing wires and different ports on hub. 5/23/02 OK, time to get this figured out! Again, I can talk to the Slave directly (via a wire) and I can talk to the Master (via the Slave) but I am not seeing the network. Bad Master? I swap with the Slave and now I can talk to the Master via a wire and the Slave via the Master, but still no network. What’s left? I plug the Slave into 10baseT hub on my workbench and HOLY NETWORKS BATMAN we’re talking! I run back out to the secretary’s desk and there’s the network! Plug her PC in to it and will let her use it for a day or two to make sure. And just in time, the electrician is here to help me run the Cat5 to the roof (2 floors up). 5/24/02 Working smoothly/transparently in the office. Nothing about the wireless to note. Got our Cat5 run to the roof and figured out where we will put the router and mount the antenna. First try will be to a mast that already has a small antenna. We will have about 2' of clearance between them. The kit is rated for 5+km with the 50' cable, but I will see about getting a shorter cable once we have placement figured out. Waiting on management at second building to schedule a time for me on the roof with maintenance. Looking forward to the long weekend. The arrow points to the other building. Note the water tower that is used as a cell tower. OR500 Slave, Antenna, 50' Cable, & lightning arrestor. Right photo: The white dot in the moutain is the water tower in the previous photo. Results? Well the first try was barely connecting. I played with the aim of the antenna some and it would finally show a connection on the indicator lights. But checking with the software, it wasn't able to connect to the other router. Hmph. Well, lets try it without the 50' cable - about the same. ??? I'm at half the advertised range with a clear shot. What gives? Double-check aim, reposition tripod, check connections, WHOA! FULL SPEED CONNECTION! Surf and e-mail for 25 minutes, test some apps, print "greetings from the roof of _________________" on a few printers in the office, and call it a day. Got to get that aim down just right. 6/15/02 Ordered a second kit and the price dropped to $1450. 7/11/02 Well the past few weeks I have been working on a VPN project that has taken priority and kept me busy, but a window of opportunity has arisen to get this completed so I am going to try to have it up and running by tomorrow. Ran my Cat5 from the 1st floor to the roof (6 floors) at the Remote location. Went to Radio Shack and bought (2) 4" antenna wall mounts, a package of cable standoffs, and a 5' antenna mast ($26.33 total). I cut a 1' piece off the mast and mounted it about 7' up the side of the maintenance room on the roof. This is high enough up to 1)keep the roof from affecting the signal, 2) be above anyone working up there, 3)still be sheltered some from wind and 4) not be visible from anywhere on the buildings parking lot. Now I have to wait for building management to drill the hole so I can connect my antenna to the OR500 inside. 7/12/02 Well after many delays and interruptions having little or nothing to do with the hardware and software, I was able to finish it and its works great! Let me go back to my last thought: no connection, no connection, full speed connection - what I didn't figure out the other day. 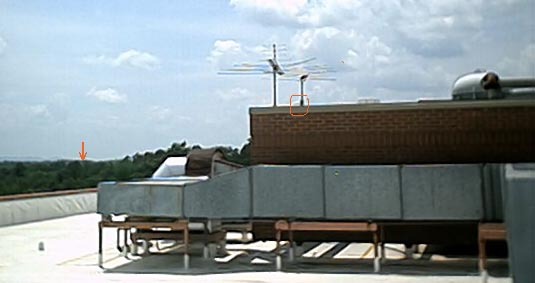 After mounting the antenna on the side of the building at location 2, running the wire through the wall and connecting, aiming the antenna, and turning it on, I was not getting a connection indicator. Every now and then my assistant would yell that it would blink, and I was afraid I was getting some interference from something near the building. Then it happened: I touched the connection between the antenna and the OR500 and the signal indicator went green! This was immediately followed by the sound of my hand slapping my forehead. I hadn't grounded the connection. A quick connection to a piece of metal and the signal was coming through loud and clear. (the gray and black cables cliped to the wall) come down. Only problem is I didn't have any washers in my toolbox and the antenna is shimmed up with few loose screws for the moment. May not hold in high winds. 7/13/02 Well, we had a storm last night, and guess what - it didn't hold in high winds. Another trip up on the roof with some washers, re-aim, and we are back in business. 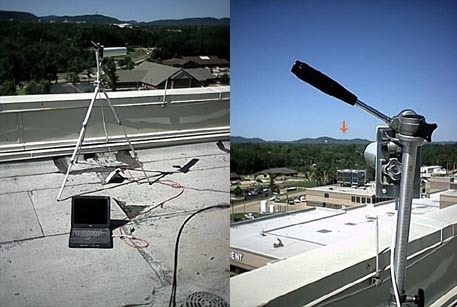 Even though we are connecting at full speed, I feel I need to aim the antenna at the main office down as the signal strength and noise levels on that end are higher than at the remote office and visually, the antenna appears to be pointing a few degrees above the other building. 7/15/02 More wind and rain this weekend, but the stats show the system worked without issue. Remote office is fully functional and completely off the T1 connection. 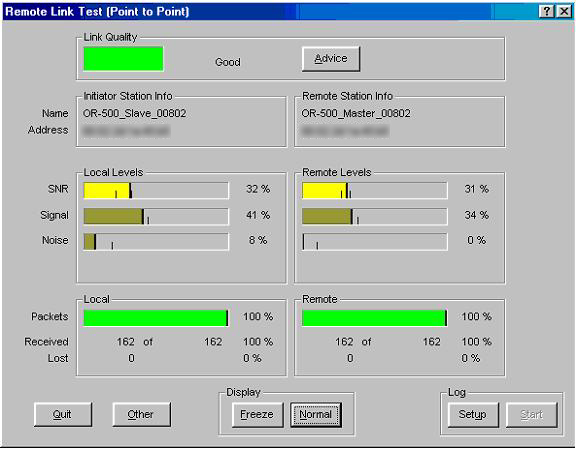 PCs can be managed as if hard wired to the network on a standard 10mips connection. Reported the project as completed to my boss and the girls in the remote office are happy it doesn't take 10 minutes to print anymore. Needless to say, my confidence in this system is very high at this point. I just spoke with the other office and they didn't notice any slowdown during the storm and the interface showed that it maintained an 11mips connection the entire 15min period. First thing I'd say to anyone trying this is make sure you GROUND,GROUND,GROUND the antenna during installation and testing. You will not get an accurate result otherwise. Security: I have configured each unit to only talk to the other so that no other wireless devices can connect. As these are routers and not Wireless Access Points, outside devices should not be able to connect anyway, but this is a simple enough precaution. I also gave each router a different password, changed the default encryption key, and set it to deny unencrypted traffic. At this point I am comfortable with the security of the system in terms of the typical high school hacker. For some reason the OR500s didn't like being plugged into my Intel Express 220T Hub but works fine with my Cisco 3500 switch and an old Accton 10 base hub. Didn't figure out why, but its not an issue for me at this point - but it's something to consider. My total cost was less than $2000 for this first installation. With the price drop on the second kit, my next installation should come in under $1600. Other systems I considered were the 3Com Wireless LAN Building-to-Building Bridge and a similar system from Hyperlinktech that is similar to the Orinoco P2P system. The Orinoco beat the 3Com in terms of price, manufacture stated range, availability as a kit, and a proven track record in wireless networks. Hyperlinktech's systems appeared to be a repackage of the Orinoco, which is possible since the Orinoco uses Hyperlinkteck's antennas, cables, and lighting arrestors. Contact me at terry_donald at hotmail.com with the subject: Re: Wi-Fi Log Book if you have any questions, comments or suggestions.